Our service in this field involves conducting on-site surveys of critical passive fire protection measures including fire doors, compartmentation lines and service penetrations, in essence, anything that could serve to control the development and spread of fire. A survey could involve surveying sections of a building, the entire building or an estate. 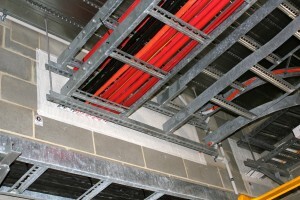 On completion, a detailed report on the status of your passive fire protection measures will be provided. Although we are based in Telford, Shropshire, we regularly carry out surveys in Staffordshire, Cheshire, Worcester, Gloucester, the West Midlands, Wales and other parts of the UK. Fire Safety Legislation requires that virtually all buildings other than dwellings are regularly checked to ensure that fire safety provisions are adequate and retain the ability to resist the passage and spread of fire. A survey of Passive Fire Protection (PFP) is an extension of the checks that are carried out during a Fire Risk Assessment. The most important consideration is the verification that the PFP supporting means of escape is adequate. The legislation referred to above is designed to save lives in the event of a fire but does not cover the issue of property protection, building owners or insurers generally want to ensure that the building is capable of withstanding the spread of fire for a period longer than that necessary to evacuate its occupants. Passive fire protection (PFP) is integrated within the constructional fabric of a building to provide inherent fire safety and protects the building against flame, heat and smoke. In a fire situation PFP initially contains a fire and maintains a safe means of escape for building occupants it then slows down the rate at which a fire spreads through a building and helps to maintain structural stability. Fire protection to structural components. Fire resistance capabilities can be seriously compromised if PFP is not properly installed by someone who has appropriate knowledge of these complex life safety products or the products not appropriately maintained throughout the lifetime of the building.